“The Russian dossier on Trump is real. 100% real” says musician-activist Moby. 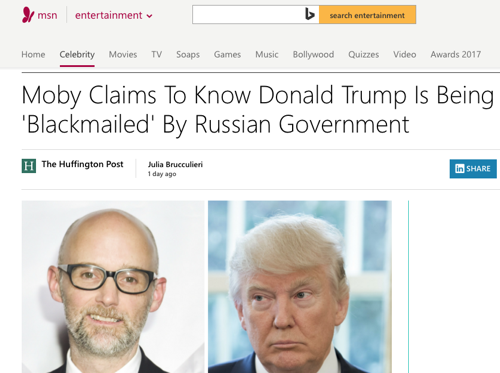 FEB 15, 2017 – Musician-activist Moby spent the weekend with friends of his that work in DC, and he says the got the lowdown dirt on the President, and that the Russian connection between the White House and the Kremlin is “100% real” he tells the world in a Facebook post. Julia Brucculieri of HuffPo on MSN.com has a good piece up on it, the link is below.